US-62, Muhlenberg County – This project involves widening of US-62 (Everly Brothers Boulevard) that extends from US-431 in Central City to the intersection of US-62 and KY-189. Palmer is responsible for both the Phase I and Phase II design, including surveying, the study of 12 alternatives, 4 alignments, and multiple typical sections. Surveying tasks for the 1.46-mile section include: reconnaissance of the existing control, establishing new control, topographic surveying, DTM, core staking, right-of-way staking, centerline staking, property tie-downs, pavement tie-downs, utility location, and deed research for a conventional survey. I-64/I-65/I-71, Jefferson County – This project is Design Section 2 of the Louisville Southern Indian Ohio River Bridges Project (LSIORBP). As a member of Kentucky Transportation Associates (KTA), Palmer responsibilities include the following survey services–establishing control using GPS methods; performing planimetric surveys (pavement tie-downs, 3D bridge surveys, and overhead/underground utility locations). 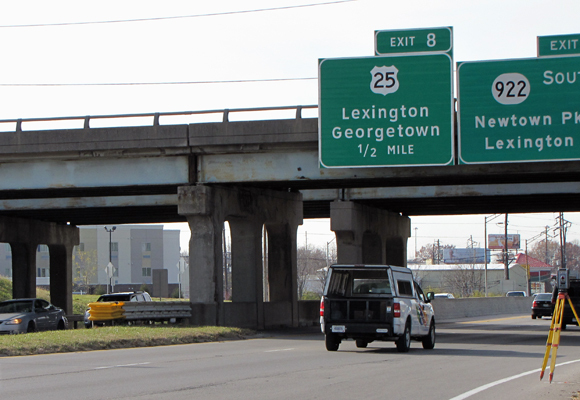 KY-4, New Circle Road, Fayette County – In 2000, Palmer Engineering was selected as part of a team to prepare a Scoping Study for the widening of 6.1 miles of New Circle Road (KY-4) in Lexington, KY. In 2004, Palmer was again selected to perform preliminary design for the Newtown Pike Interchange to evaluate the use of collector-distributor and service roads to connect the Newtown Pike and Georgetown Road Interchange. The Palmer survey team used existing LFUCG control points to establish additional control to be used in precise survey locations. The team performed planimetric surveys, utility location, and property location.